"Meridith Elliott Powell offers you the genius of taking the overwhelming and complex and making it clear, simple, and actionable. This is the secret of great coaching; and in her terrific new 42 Rules to Turn Prospects into Customers, Meridith provides you with a streamlined, fun, and effective game plan for success. Elevate your confidence and ignite great momentum by reading of Meridith's secrets!" "Between the specific action steps and the simplicity of Meridith's ideas, I found myself eager to try what I learned in this benefit-rich book. I gained ideas for my business in almost every chapter and have been effortlessly taking new steps forward with my sales process. Meridith just makes the sales process so easy!" The economy is changing. Trust and value have become the new Return on Investment (ROI). Consumers are the new drivers of the market; they are in control of where, when, how and from whom they buy. To succeed in this economy you need to do it all – build relationships, establish trust and value, maximize efficiency and generate bottom line results. 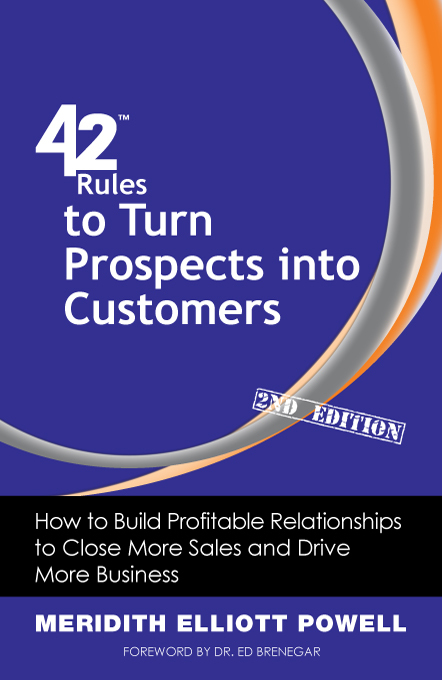 In her new book, 42 Rules To Turn your Prospects into Customers (2nd Edition), Meridith Elliott Powell draws on her 20-plus years in sales to give you a practical step-by-step guide on how to find the right prospects, build profitable relationships, close more sales and turn your customers into champions for your business. Through her experience, research and interviews with sales professionals, clients and executives, Powell has gathered valuable information that will help you navigate this change, get ahead of the curve, and succeed. For sales people, business owners, and executives who need to know how to identify the right prospects; build quality relationships, and maximize their sales efforts, this book provides solid, actionable answers. The rules can be learned quickly and implemented immediately so you and your teams can develop your most critical skill – striking the balance between relationships and results. How do I standout from the competition? Powell, a life-long student of sales and the sales process, is passionate about helping her clients succeed. Her experience, dedication to research and her desire to listen and learn from the ultimate teacher – our customers – ensure readers gain first hand knowledge of how to Turn Prospects into Customers. 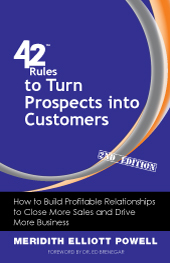 Want a branded edition of 42 Rules to Turn Prospects Into Customers? "In today's market, I need all the customers I can get. I wasn't happy with the number of prospects who were slipping through the cracks. Meridith was my missing ingredient. Sales never came easy to me, but Meridith gave me a whole new way to look at the process—a way that fit my personality—a way that I could understand—that actually worked. She didn't just leave me with a strategy on paper—she walked me through it, step by step. There are a lot of books, speakers and coaches out there, and a lot of information to choose from. Meridith gave me that information in a way that made it easy and FUN! Her coaching style is funny, real, and relatable. I highly recommend this book for those who want to turn prospects into customers. The value I gained from Meridith more than made up for the investment." "Sales can seem overwhelming and scary to so many, but thank goodness for Meridith. She approaches the topic of sales in a unique way in her new book by laying out easy steps that lead to great relationships that close that deal. This book is ideal for everyone from the sales professional to the professional who never thought they would have to sell. By the time you finish Meridith's book, you will be a salesperson with a smile." Meridith Elliott Powell A coach, speaker and business development expert. Meridith is passionate about networking, sales and service, and has dedicated herself to discovering why some people struggle and others succeed when it comes to developing these critical skills. On a self-described mission, Meridith uses everything she has learned to develop programs, coaching techniques and strategies to help people ignite their internal sales/networking flame. Upbeat, energetic and cutting edge are just a few words used to describe Meridith’s selling and writing style. Prior to founding her company, MotionFirst, Meridith spent more than 20 years working in sales and leadership in the fields of finance, sales, marketing and strategy. In addition, she has been recognized numerous times for both her professional and charitable achievements. Today she works as a certified strategist, coach, and human behavior specialist, working with a wide variety of clients ranging from health care to finance. She is an active member of the National Speakers Association, Lessons in Leadership and the American Society For Training and Development. In addition, she holds certifications as both a business and emotional intelligence coach. For more information please visit www.motionfirstnow.com or direct line 828-243-3510.